When Panera started listing calories on their menu, I told the person taking my order that I was so happy they did. 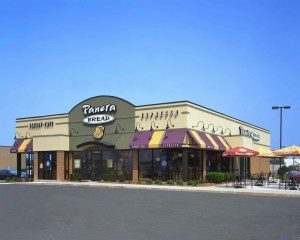 The reply, “Most people don’t like it!” While I don’t eat breakfast at Panera, I usually have lunch there once a week and dinner about twice a month. I really enjoy their Pick Two salad and soup combo. And you can ask for an apple instead of the baguette or chips with this menu item. Thanks, Neva. I’ll admit, I’m not wild about posting just calorie information on menu boards, since calories only tell part of the story. I prefer the full nutrition information available online or in brochures. But then again, I’m a nutrition nerd 🙂 I do like the You Pick Two options and getting an apple instead of the chips as a side for no extra cost. I think the reason most of their customers don’t like the calorie info is because they don’t want to know how many more calories they are eating than they should! But it really helps me. Sometimes the descriptions don’t give a true picture of the calories an item contains, meaning that it is often more than you would expect.